The Walker name has been synonymous with ceramics in Victoria for more than one hundred years. When Edgar E. Walker founded and later owned the Australian Tessellated Tile Company in Mitcham in 1885, he began a family tradition in clay which continues today, four generations later, with Walker Ceramics at Croydon (Victoria, Australia). The family commitment to fine quality clay manufacture began with Edgar E. Walker, his four sons and grandson, Geoffrey Walker. 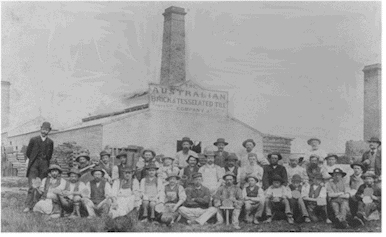 They established the tile company which was, at one time, the largest tile producing plant in the Southern Hemisphere. Importantly, it had also always supplied Technical Colleges and potters with fine quality clays, glazes and ceramic materials. Edgar E. Walker and staff of the original family company – The Australian Brick and Tessellated Tile Company in 1908. The management and staff gather to welcome home Edgar E. Walker from one of his overseas trips in 1923. Walker Ceramics was established in 1955 by Geoffrey and Constance Walker. Geoffrey studied ceramics in the years before and after the Second World War at Stoke Technical College and later worked in the UK and USA before building the factory in Wantirna. Production began with glazed porcelain functional ware, then specialized floor tiles, electrical and acid-proof porcelains, architectural ceramics, refractories and salt glazed quarry tiles. Despite a fire which completely destroyed the factory in 1962, the company went on to produce stoneware and porcelain bodies, often to potter’s own specifications. In the 1960’s Walker Ceramics commenced manufacture of its first filter pressed white earthenware bodies for commercial potteries and art suppliers. During this time, the Walker Ceramics’ factory at Wantirna became not only a place to source an increasing range of ceramic supplies and quality clay bodies and glazes, but a busy and lively meeting place for potters exchanging information. By the mid 1970’s more than 25 bodies were being produced and the market had expanded interstate and to New Zealand. In the 1980’s Walker Ceramics in association with Master Potter Greg Daly, produced the first series of instructional video tapes (now converted to DVD’s), detailing many different ceramic techniques presented in Greg’s workshops. In 1982 David Walker completed an Honours degree in Ceramic Technology from the North Staffordshire Polytechnic in Stoke-on-Trent (UK) and returned to Australia to rejoin the business. Today Walker Ceramics produce and sell in excess of 60 Ceramic bodies, 200 plus glazes, Liquid Opaque Underglazes, Design Colour Concentrates and all the tools and equipment the pottery market requires. As well as their own shop in Canberra, the distribution network extends to all major centres of Australia, New Zealand, Singapore, Indonesia and the United Kingdom – where the pottery community are appreciating the specialist qualities of Australian made and developed ceramic bodies, glazes and colours. When Walker Ceramics moved to the Wedgwood factory in Croydon in 1988, they completely re-built and enlarged the clay production facility established at Wantirna. A new laboratory was equipped and specialist staff were trained for Research and Development and for quality control. This began at the clay pits with testing and stockpiling and continued in the laboratory. All clays are continuously checked in the laboratory for plasticity, colour, shrinkage and porosity by gradient furnace firing and most importantly, the testing of all bodies for expansion standards to ensure the matching of glazes. In 2005 David Walker was approached by John Feeney of Sandisons in Queensland, with an offer to continue the Feeney Clay tradition. A new company called Feeneys Clay was started, then moved from the Wulkuraka site, completely re-furbished and upgraded and then established in a “new” factory at West Ipswich. The business then went under further changes in 2008 – David Walker decided to continue the Walker tradition in Ceramics and purchased the Walker Ceramics company outright. A new manufacturing facility was set up for all the Walker White bodies when the business moved from Lusher Road in Croydon. 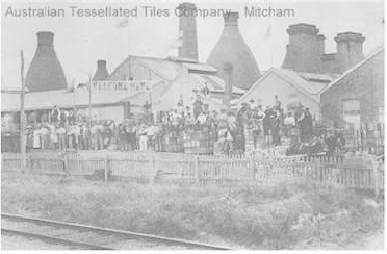 Once the Sales and Distribution factory was established in Croydon South the traditional fireclay based bodies were reformulated to be made at the new Feeneys Clay plant in West Ipswich in Queensland. This range is in the marketplace and gaining loyal support. Cesco colours became part of Walker Ceramics production in 2010 when Jerry Tonkavic of Ceramic Supply Company in Sydney decided to retire and invited David Walker to continue with the Cesco tradition and produce all Cesco Colours and Glazes. On top of this Ferro decided to cease production in Australia and import all colours and frits from their manufacturing plants overseas and also invited Walker Ceramics to continue their ball milled glaze production for their customers. In May 2010 a lease on the factory next door was completed and extension of the current glaze room area was commenced in preparation of fitting in both the Cesco equipment and ball mills from Ferro. With the changes in Ferro all the colour and glaze ranges needed to be reformulated to suit the new stains and frits. Between 1977 and 1996 Walker Ceramics presented a Walker Ceramic Award annually to Graduating Ceramics students from around Australia. This was exhibited at the prestigious Victorian Arts Centre from December to January each year and enabled the students to have an opportunity to exhibit their talents to a broad range of public from throughout Australia and overseas. The Walker Ceramic Award Collection of all the winners and carefully selected pieces from each years exhibition were on permanent display in the Walker ceramic Gallery in Croydon, Victoria until 2008, when David Walker donated the entire collection to Manningham City Council Art Gallery in Doncaster – Victoria. This enables ceramists, students and the public at large to view this wonderful collection in this public space.